The rookies from Colorado and Anaheim faced off on Sunday in what turned out to be a very feisty affair, but ultimately the Ducks came out on top by a score of 5-2. The game was a little slower in terms of skill than yesterday’s game against Vegas, but the Avs now head into their third and final game of the tournament winless. Igor Shvyrev was moved back to his natural position at center and looked significantly more comfortable. He had a few good chances in front of the net but was unable to actually bury anything, but his skill was on display all night. He also showed a level of feistiness that we now know is a part of his game. Early in the game he took a big hit in open ice, but moments later went back at the same player in the corner and threw a nice hit of his own. That tenacity to go with his skill level will help him succeed in North America. Another game, and another goal by Brandon Saigeon. And just like his two goals yesterday, it was a rebound goal where he crashed the net. He looks like he’s pushing real hard to earn that professional contract and maybe avoid going back to the OHL. Josh Anderson played his usual physical game all night long, throwing quite a few big hits. Unfortunately, the puck is still his enemy, as he struggles when forced to play with it. On the backbreaking fourth goal by Anaheim, he pinched in as the fourth offensive threat, but the puck rolled off his stick and the Ducks went the other way to essentially close out the game. Nicolas Meloche is easily the most polished defenseman in this tournament for the Avs. His stick work was on point for most of the evening, breaking up some rushes for the Ducks forwards. He also showed some good work in the offensive zone in terms of puck protection, but ultimately he stayed to the outside and wasn’t able to get any real chances out of it. Justus Annunen had a strong start to the game but had a rough second period, giving up three goals in relatively short order. None of the goals against were egregious in any way. He’s a significantly bigger goalie than Petr Kvaca and it shows. He also looked much calmer than Kvaca did yesterday. A couple of amateur tryout defensemen in Sean Strange and Alex Breton made some terrible errors with the puck on the first three goals. It was not a good showing for Strange overall, whose fighting for a spot in the organization. Martin Kaut had another average showing at best. It’s possible nerves are playing a role in some of this, but he doesn’t look like a player who wants the puck on his stick for very long. He’s quick to get rid of it and his first choice in the neutral zone has been to dump it in through two games rather than keep possession. Michael Joly was a big part of the Colorado Eagles success in the ECHL last year, and displayed some high level skill in this game. 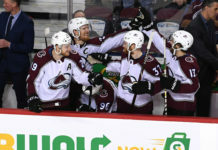 His patience with the puck, as well as some shifty skating and stickhandling, created the first goal for the Avs on the power play. While he doesn’t have an NHL contract, he is likely to play a role in the Eagles even with their move to the AHL. 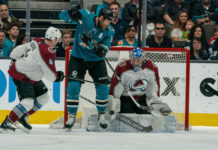 The Avalanche play their final game in the tournament on Tuesday afternoon against the San Jose Sharks. The game starts at 12:30 MST. 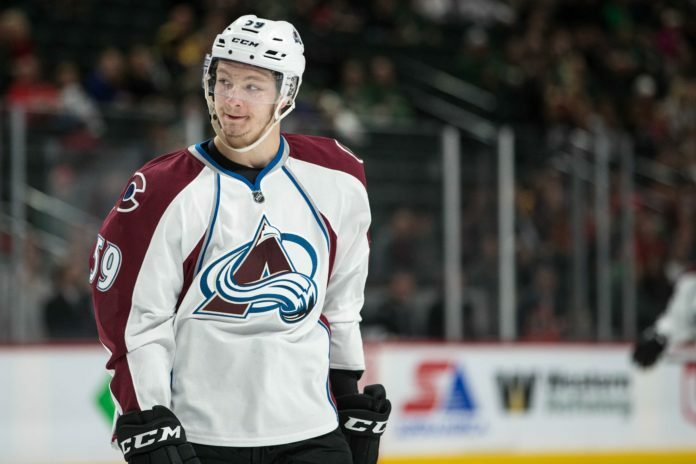 The Avs rookies will practice on Monday.